AppsFlyer has added new abilities to its dashboard, allowing advanced filtering and grouping options. You can now filter according to Media Source and Geo location and group by Media Source/Campaign, Site ID and Geo location. You can also drill-down to view Ad Set and Ad level data. 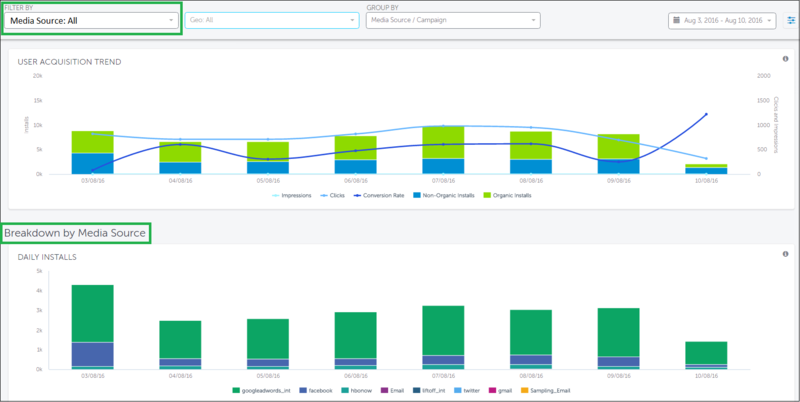 By filtering and grouping the information in the dashboard using the advanced options, you can view the most precise and relevant data for your apps. AppsFlyer offers you a number of filtering options to let you refine your search and view the information most relevant to you. For each filter (Media Source, Geo and Campaign) you can select several options to be filtered at the same time. An X appears next to each selection. In the field, you are prompted as to how many filters you have selected. Select the Media Source for which you want to view the data. Used for comparison of acquisition sources. For example, if the same targeting is used for Google and Facebook so you can view which source is more successful when a campaign is directed towards the same target audience. 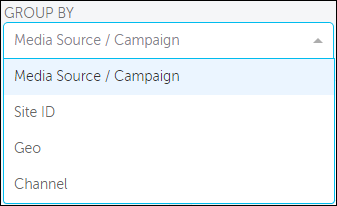 In addition, by clicking on the name of the campaign, you can drill-down to ad set and then to ad level to view in-depth campaign data. This is only available to those media sources providing the information. Based on AppsFlyer's af_siteid parameter which represents the publisher that drove the install. You can see which publisher brings you the highest quality users. You can then easily identify which Site IDs have a low conversion rate. This indicates the quality and legitimacy of the traffic. Allows you to see the best traffic by country. This has a direct impact on how much you are willing to invest per country. Allows you to view the data per channel. For example, viewing Facebook channels (Facebook, Instagram, Audience Network or Messenger) and Google channels (Search, UAC, mGDN etc...). By default, Media Source / Campaign is displayed. 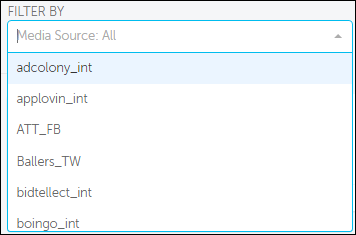 When you select Site ID, the data displayed is based on your filter selections for Site ID. Site_id data is available as of 16 May 2016 and onwards. You are further presented with a breakdown of the data based on Site ID. When you select the Geo option you are presented with a breakdown of the data by country. For the advanced filtering options click on the icon. Once you select a Campaign/Channel but no Media Source, a warning notification is displayed indicating that you must select a media source first. Mr A. Flyer wants to examine the campaigns he is running for his app for a particular date range, in this story - the last 7 days. At the top level he can view all campaigns grouped by Media Source. He then wants to refine his search to view the data for the different countries that his campaigns are active in. To do so, grouping the information by Geo location allows him to view the statistics for all the countries. From viewing this information he wants to focus on a particular country. Having grouped his campaigns by geo location and media source, he can then filter the data by Geo location. Mr A. Flyer can then filter by Site ID allowing him to hone his search to view how a specific Site ID is performing and the quality of the traffic driven from that site.